An elderly woman has been taken to hospital with life-threatening injuries after she was hit by a bus in Bath city centre. Emergency services attended the scene in James Street West at about 11:30 BST to find the pedestrian trapped under the vehicle's rear wheels. 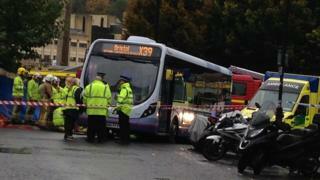 Fire crews lifted the bus to enable the woman to be freed before she was taken to Bristol's Southmead Hospital. Police said a man who was with the woman suffered minor injuries. A force spokesman said the road would remain closed until further notice to allow investigators to examine the scene.